See ya, Winter. Bring on the Flowers! Spring is just around the corner, which means it’s time to brighten things up. As the colours outside begin to change from gloomy grays to bright and sunny pastels, our interior designs must also deserve a bright new look. So it’s time to let your home blossom with these springtime interior design tips. Break out of your winter rut and warm up to spring with these great springtime trends. After months of snow, rain and freezing temperatures, the best way to celebrate spring is by bringing in fresh plants to breathe some life into a room . The colour green represents refreshment and revitalization, something we could all use after a long cold winter. And with so many shades, tones and styles to choose from, green will be very easy to incorporate, no matter your style preferences. The Leo Ottoman in Lime is the perfect shade of green to bring the outside in. Shop the look here! Although this trend was first spotted at New York Fashion Week in Fall 2016, it has carried its way into Spring 2017 as well. Mixed patterns have become very popular as a statement piece to draw attention to a corner of any room. The days of statement pieces being “too busy” are long gone. This is the year of creating an impact with your interior design plan. 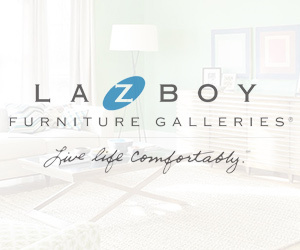 La-Z-Boy has a wide selection of living room chairs with more than hundreds of colours and mixed patterns. These chairs will be sure to be a conversation starter. Pleating, folding and materials such as velvet or cotton are making a huge comeback this year. Fabrics such as faux furs, mohair, and luxuriously soft materials are a must have in 2017. It’s all about the feels! The Roundabout Ottoman is a perfect statement piece and has the texture to match, with welted cotton and a button-tufted top. A little pop of colour never hurt anyone! Spring is the season to experiment with bright accents. Colour can really bring some cheer and happiness into any space, and isn’t that what spring is all about? Add a pop of colour to any room with the wide selection of chairs and sofas. With hundreds of covers to choose from, that pop of colour is just a chair away. This year, interior designers are saying that navy blues are the new black. Add some navy into your life with deep hues and rich floral patterns that are perfect for spring. This look adds both drama and elegance. The Aberdeen premier sofa will make you do a doubletake. This perfect shade of navy it’s perfect for spring! Spring is the perfect time to update your home and give it a fresh new look. La-Z-Boy has all your home decorating needs and you can even plan your room layout on their 3D room planner. Visit La-Z-Boy’s website for great ideas to get your home ready for this season. So spring into action, and let your house blossom!